For two days after I saw Martin Scorsese's new film, "GoodFellas," the mood of the characters lingered within me, refusing to leave. It was a mood of guilt and regret, of quick stupid decisions leading to wasted lifetimes, of loyalty turned into betrayal. Yet at the same time there was an element of furtive nostalgia, for bad times that shouldn't be missed, but were. Most films, even great ones, evaporate like mist once you've returned to the real world; they leave memories behind, but their reality fades fairly quickly. Not this film, which shows America's finest filmmaker at the peak of his form. No finer film has ever been made about organized crime - not even "The Godfather," although the two works are not really comparable. "GoodFellas," scheduled to open Sept. 21 in Chicago, is a memoir of life in the Mafia, narrated in the first person by Henry Hill (Ray Liotta), an Irish-Italian kid whose only ambition, from his earliest teens, was to be a "wise guy," a Mafioso. There is also narration by Karen, the Jewish girl (Lorraine Bracco) who married him, and who discovered that her entire social life was suddenly inside the Mafia; mob wives never went anywhere or talked to anyone who was not part of that world, and eventually, she says, the values of the Mafia came to seem like normal values. She was even proud of her husband for not lying around the house all day, for having the energy and daring to go out and steal for a living. There is a real Henry Hill, who disappeared into the anonymity of the federal government's witness protection program, and who over a period of four years told everything he knew about the mob to the reporter Nicholas Pileggi, whose Wiseguy: Life in a Mafia Family was a best-seller. The screenplay by Pileggi and Scorsese distills those memories into a fiction that sometimes plays like a documentary, that contains so much information and feeling about the Mafia that finally it creates the same claustrophobic feeling Hill's wife talks about: The feeling that the mob world is the real world. Scorsese is the right director - the only director - for this material. He knows it inside out. The great formative experience of his life was growing up in New York's Little Italy as an outsider who observed everything - an asthmatic kid who couldn't play sports, whose health was too bad to allow him to lead a normal childhood, who was often overlooked, but never missed a thing. There is a passage early in the film in which young Henry Hill looks out the window of his family's apartment and observes with awe and envy the swagger of the low-level wise guys in the social club across the street, impressed by the fact that they got girls, drove hot cars, had money, that the cops never gave them tickets, that even when their loud parties lasted all night, nobody ever called the police. That was the life he wanted to lead, the narrator tells us. The memory may come from Hill and may be in Pileggi's book, but the memory also is Scorsese's, and in the 23 years I have known him, we have never had a conversation that did not touch at some point on that central image in his vision of himself - of the kid in the window, watching the neighborhood gangsters. Like "The Godfather," Scorsese's "GoodFellas" is a long movie, with the space and leisure to expand and explore its themes. It isn't about any particular plot; it's about what it felt like to be in the Mafia - the good times and the bad times. At first, they were mostly good times, and there is an astonishing camera movement in which the point of view follows Henry and Karen on one of their first dates, to the Copacabana nightclub. There are people waiting in line at the door, but Henry takes her in through the service entrance, past the security guards and the off-duty waiters, down a corridor, through the kitchen, through the service area and out into the front of the club, where a table is literally lifted into the air and placed in front of all the others so that the young couple can be in the first row for the floor show. This is power. Karen doesn't know yet exactly what Henry does. She finds out. The method of the movie is a slow expansion through levels of the Mafia, with characters introduced casually and some of them not really developed until later in the story. We meet the don Paul Cicero (Paul Sorvino), and Jim (Jimmy the Gent) Conway (Robert De Niro), a man who steals for the sheer love of stealing, and Tommy DeVito (Joe Pesci), a likable guy except that his fearsome temper can explode in a second, with fatal consequences. We follow them through 30 years; at first, through years of unchallenged power, then through years of decline (but they have their own kitchen in prison, and boxes of thick steaks and crates of wine), and then into betrayal and decay. At some point, the whole wonderful romance of the Mafia goes sour for Henry Hill, and that moment is when he and Jimmy and Tommy have to bury a man whom Tommy kicked almost to death in a fit of pointless rage. First, they have to finish killing him (they stop at Tommy's mother's house to borrow a knife, and she feeds them dinner), then they bury him, then later they have to dig him up again. The worst part is, their victim was a "made" guy, a Mafioso who is supposed to be immune. So they are in deep, deep trouble, and this is not how Henry Hill thought it was going to be when he started out on his life's journey. From the first shot of his first feature, "Who's That Knocking at My Door?" (1967), Scorsese has loved to use popular music as a counterpoint to the dramatic moments in his films. 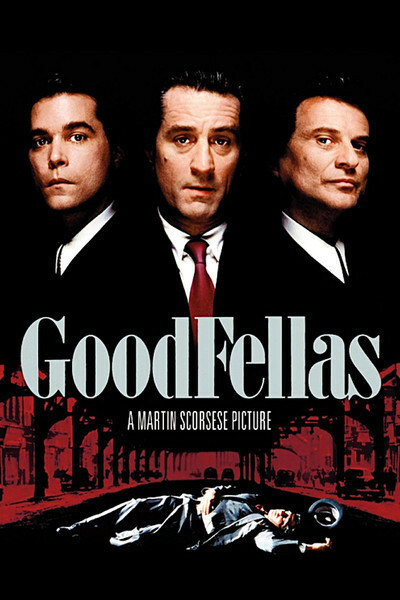 He doesn't simply compile a soundtrack of golden oldies; he finds the precise sound to underline every moment, and in "GoodFellas," the popular music helps to explain the transition from the early days when Henry sells stolen cigarettes to guys at a factory gate, through to the frenetic later days when he's selling cocaine in disobedience of Paul Cicero's orders, and using so much of it himself that life has become a paranoid labyrinth. In all of his work, which has included arguably the best film of the 1970s ("Taxi Driver") and of the 1980s ("Raging Bull"), Scorsese has never done a more compelling job of getting inside someone's head as he does in one of the concluding passages of "GoodFellas," in which he follows one day in the life of Henry Hill, as he tries to do a cocaine deal, cook dinner for his family, placate his mistress and deal with the suspicion that he's being followed. This is the sequence that imprinted me so deeply with the mood of the film. It's not a straightforward narrative passage, and it has little to do with plot; it's about the feeling of walls closing in, and the guilty feeling that the walls are deserved. The counterpoint is a sense of duty, of compulsion; the drug deal must be made, but the kid brother also must be picked up, and the sauce must be stirred, and meanwhile, Henry's life is careening wildly out of control. Actors have a way of doing their best work - the work that lets us see them clearly - in a Scorsese film. Robert De Niro emerged as the best actor of his generation in "Taxi Driver." Joe Pesci, playing De Niro's brother in "Raging Bull," created a performance of comparable complexity. Both De Niro and Pesci are here in "GoodFellas," essentially playing major and very challenging supporting roles to Ray Liotta and Lorraine Bracco, who establish themselves here as clearly two of our best new movie actors. Liotta was Melanie Griffith's late-arriving, disturbingly dangerous husband in "Something Wild," and here he creates the emotional center for a movie that is not about the experience of being a Mafioso, but about the feeling. Bracco was the cop's wife from out in the suburbs in "Someone To Watch Over Me," a film in which her scenes were so effective that it was with a real sense of loss that we returned to the main story. The sense of their marriage is at the heart of this film, especially in a shot where he clings to her, exhausted. They have made their lifetime commitment, and it was to the wrong life. Many of Scorsese's best films have been poems about guilt. Think of "Mean Streets," with the Harvey Keitel character tortured by his sexual longings, or "After Hours," with the Griffin Dunne character involved in an accidental death and finally hunted down in the streets by a misinformed mob, or think of "The Last Temptation of Christ," in which even Christ is permitted to doubt. "GoodFellas" is about guilt more than anything else. But it is not a straightforward morality play, in which good is established and guilt is the appropriate reaction toward evil. No, the hero of this film feels guilty for not upholding the Mafia code - guilty of the sin of betrayal. And his punishment is banishment, into the witness protection program, where nobody has a name and the headwaiter certainly doesn't know it. What finally got to me after seeing this film - what makes it a great film - is that I understood Henry Hill's feelings. Just as his wife Karen grew so completely absorbed by the Mafia inner life that its values became her own, so did the film weave a seductive spell. It is almost possible to think, sometimes, of the characters as really being good fellows. Their camaraderie is so strong, their loyalty so unquestioned. But the laughter is strained and forced at times, and sometimes it's an effort to enjoy the party, and eventually, the whole mythology comes crashing down, and then the guilt - the real guilt, the guilt a Catholic like Scorsese understands intimately - is not that they did sinful things, but that they want to do them again.